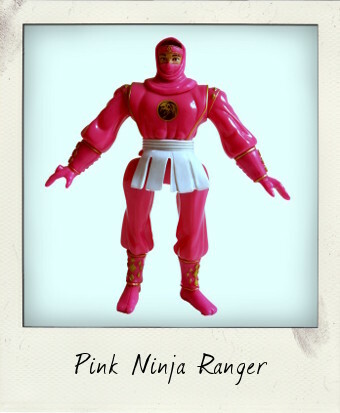 Mighty Morphin Power Rangers Pink Ninja by Bandai! Who can resist a ninja action figure?! Not me, evidently, as I knew I had to have this figure the second I saw it in a charity shop on a recent trip back to the UK to visit friends and family. 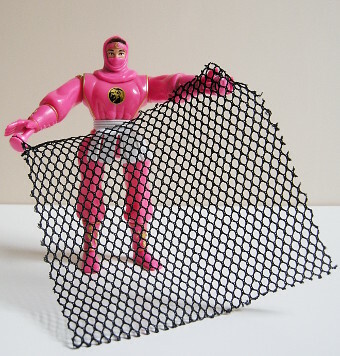 I wasn't entirely sure who this character might be, but knew it probably wouldn't take much sleuthing to discover the identity of this dazzling pink net launching girl ninja! She may look like something out of Disney's Aladdin, but I soon discovered that this 5 ½ inch action figure is a Ninja Ranger released as part of Bandai's Mighty Morphin Power Rangers toyline in 1995, in conjunction with the TV show Mighty Morphin Power Rangers Season 3 and the big screen version Mighty Morphin Power Rangers: The Movie. The final season to use the “Mighty Morphin” epithet, the US TV show famously borrowed action footage from the Japanese series Ninja Sentai Kakuranger. This season also saw the introduction of new Ninja powers. Kimberly Ann Hart was the Pink Mighty Morphin' Power Ranger and first Pink Ninja Ranger. Bandai produced not only the Rangers Tommy, Kimberly, Billy, Rocky, Adam and Aisha, and chief villains Ivan Ooze, Tengu, Lord Zedd and Mordant, but also their special Ninja Ranger transformations - six Ninjas with individual ninja action features: a White Ninja with a “Twirling Action”, a Black Ninja with a “One-Two Punch”, a “Kick Action” Yellow Ninja, a “Disc Firing” Blue Ninja, a “Sword Slashing” Red Ninja, and our very own “Net Launching” Pink Ninja Ranger here. The articulation might be a little odd on this figure – cut joints in the calves and forearms allow for 360° feet and hand turns - but her accessory and action feature is actually lots of fun! Plug the net supports into her wrists, flick a switch on her back and the net is launched. I was amazed to find that this figure still had the action accessory – a rare thing in a loose figure – and that her white skirt (which is detachable) was still in place.